Have a friend in need of a little creative nudge? 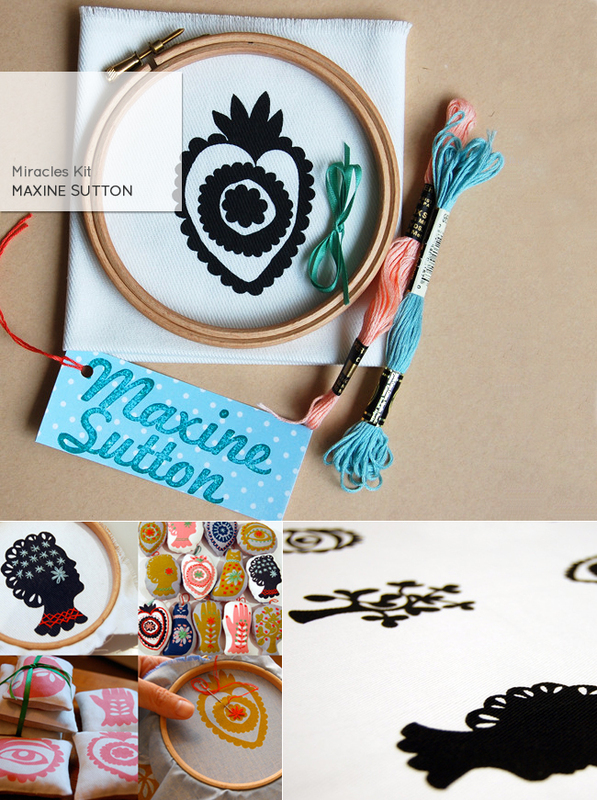 I think Maxine Sutton's Miracles Kit should do the trick. It comes with everything you need to get your craft on! "Make something yourself! Inspired by the Mexican votives known as Milagros, a single hand-printed organic cotton piece, depicts six individual motifs - cat, heart, hand, head, tree and eye - for you to embroider, cut out and sew with your own recycled cotton or favourite fabric backing.Fill with lavender or fabric scraps. Make as hanging decorations or lavender drawer/wardrobe sachets, mobiles for children’s rooms, toys, brooches or appliqué patches for clothing or cushions, …the possibilities are endless." ooh....such a great idea! Love this! Fantastic idea. I love everything embroidery-related. So simple, too! Oh, how much I love this!!! What a wonderful find! Off to see more. Thanks. Thanks for the heads up, it's gorgeous!! The better part of one's life consists of his friendships.its cute for all my friends..